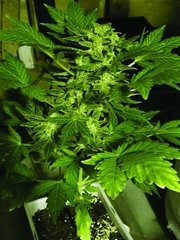 Winner of "High Times Cannabis Cup 2000" for "Best Hemp Product"
Box of 25 Assorted colored booklets. 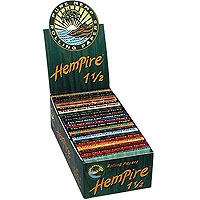 Hempire's 1 1/2 inch pure hemp rolling papers. The Hempire Brand delivers an outstanding hemp rolling paper . These things fly out of our store and we have yet to have a negative comment either there or from our customers. They are not too thin, nor too thick and are priced reasonably with great packaging panache. Completely neutral in flavor with just the right amount of gum, these hemp sheets come in 1.25 and 1.5 width sizes, each 78mm long. The display box, which comes free with each box of papers, (as most papers do) is really a very good attention-getter in POS positions. We have found the 1.25 width to be more popular as the rolling public in our area seems to be pretty adept at hand rolling. The wider ones are more suited to the novice roller or to those who want a really FAT cigarette. Again, a very good keystone product with very good supply lines and availability.